The Dodge Journey is the cheapest 7-passenger CUV you can buy, and that’s really the only reason to even consider it. 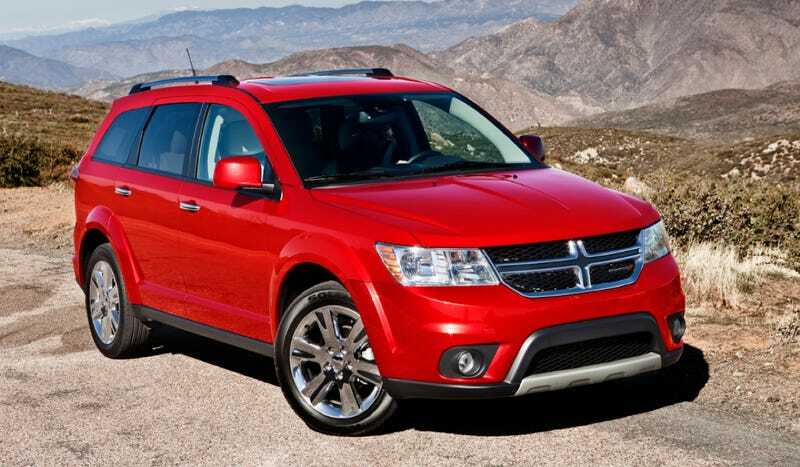 What do you need to know before you buy a Dodge Journey? Don’t worry, we’ll tell you everything right here in our Buyer’s Guide. You’re surfing the interwebs because you’re having another kid and that means you have to trade in your old Jeep Cherokee XJ for a vehicle with a third row. You go to automakers’ websites and start pricing out CUVs. Then you get to Dodge’s site and you can’t believe your eyes: A 7-passenger CUV for less than 24 grand! Let’s be honest, if you’re looking to buy a Dodge Journey, you’re doing so because you need the third row seat and you think you’re too cool for a minivan. And if your criteria for an automobile is simply “Has third row seat, isn’t a minivan, drives,” then go right on ahead and stroll down to your local Dodge dealer. They’ll probably sell you one real cheap. But if you actually care about fuel economy or if you’re even remotely interested in how your car drives, buying the Dodge Journey will be your downfall. You’ll cry yourself to sleep the first few nights. Then you’ll start sleep walking, and before you know it, you’re standing in front of your newly purchased CUV at 3am in your pajamas with a five gallon gas can and a lighter. It’s just not worth it, folks. Like the underwhelming Jeep Compass and Patriot, the Dodge Journey was designed during the dark ages in Chrysler history. It’s built on the same Mitsubishi GS platform that graced us with superstars like the Dodge Caliber, Jeep Patriot, Jeep Compass, Dodge Avenger, and Chrysler Sebring. Fiat did their best to spruce up the Journey, but today’s car is still the worst in the segment. The Dodge Journey launched for the 2009 model year with a 3.5-liter V6 mated to a 6-speed auto and a 2.4-liter I4 mated to a 4-speed slushbox. The engines struggled to motivate the roughly 4,000-pound CUV, the suspension could barely handle a soft bend, and the interior plastics were as hard as ceramic. The early part of the next decade brought some revisions as Fiat desperately transforming the trainwreck that was the Chrysler lineup into something that could actually compete with a 1995 Chevrolet Cavalier. The update brought a new fascia, a nicer interior, updated suspension and steering, and the 3.6-liter Pentastar V6. Fast forward to 2015, and you’re still stuck with a 4-speed automatic slushbox unless you opt for the upper trim levels or tick the Pentastar V6 box. And even then, the V6 and the 6-speed only manage 19 MPG combined, so you can put a big “X” through that “fuel economy” bullet at the top of your “Most Important Things I’m looking For In A New CUV” list. We wouldn’t. Go buy a minivan if you need more space.